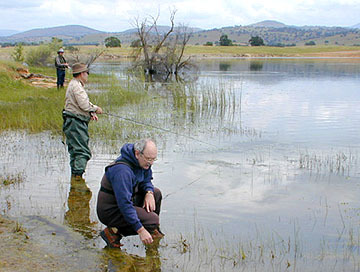 On April 15, 2000 sixteen club members made the trip to Kelsey Ranch in search of bass. Where, you may ask, is Kelsey Ranch? The ranch is just a little ways outside of Snelling which is located along the Merced River just below Lake McSwain. Snelling is South of Modesto, but not as far as Fresno. Some of the members left Friday evening and camped at Lake McSwain and others left the Bay Area on Saturday morning. The drive takes about 2 - 2 1/2 hours. Due to the recent change of weather the bass apparently moved off the beds. However, we had great weather for the fish out. Scattered clouds, minimal wind and no rain made for a great time to be had by everyone. Fishing wasn�t easy this day, it took work. Most everyone caught some fish. Wayne was busy giving Bill Stoval some casting tips at the boat launch when Bill caught his first bass ever. It was exciting. Art Kauffman cornered a school of bass just off the point of an island and had a great time. Richard Holubek and Larry Duarte got into some nice bass and you could hear their shouts clear across the lake. Phil Drees and Wayne Taylor Jr. got into some nice bass. Reportedly Phil certainly took advantage of the back seat of the bass boat, picking off the fish as they moved from spot to spot. Being one of the first to arrive at the lake Igor managed to get a bass and bluegill before any else even got on the lake. 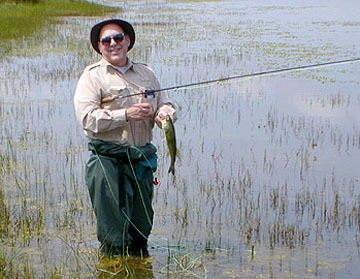 He continued his success by using a secret fly, tied by Denny Rickards. Alan Fisher fished so hard he took a break after lunch. The BBQ lunch gave everyone a chance to gather and share their exploits of the morning. 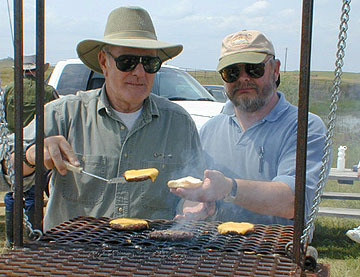 After nearly everyone had seconds on the BBQ Burgers the emphasis was back to fishing. The bass were keyed in on what appeared to be small bait fish. You could see the big bass break surface, but you could not see what they were chasing. On May 6, 2000 we have another trip to Kelsey scheduled. The fishmasters have increased the number fly fishers on this trip. If you are interested in going please contact Rich or Wayne immediately. All in all, it was a successful day at Kelsey Ranch and we anticipate that the May fishout will be better.